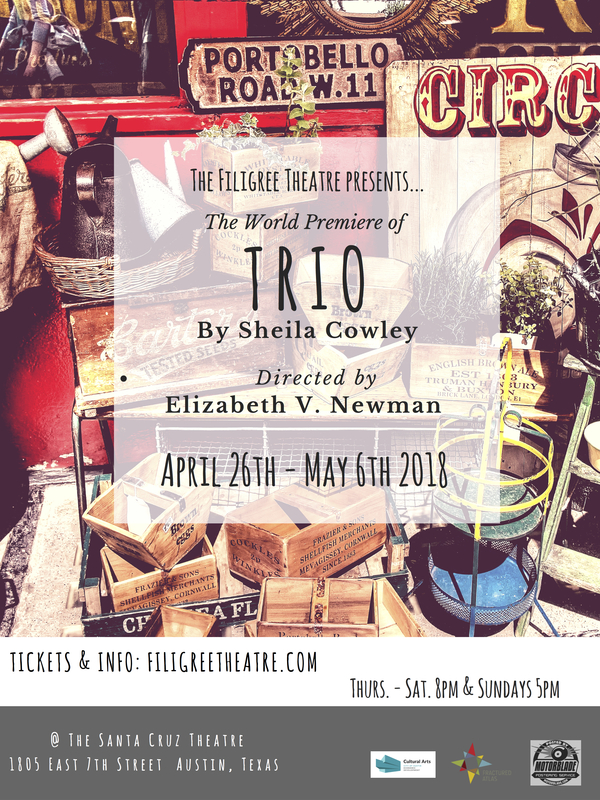 SYNOPSIS: ‘Trio’ is centered around actors, Leslie and Tim, who are rehearsing a children’s show in a spooky old garage while a Trio of silent clowns creates a magical world of make-believe from found objects surrounding them. When Fletcher, Tim’s old college love appears, a three-way romantic triangle takes shape and the real world merges with the world of make-believe through swords, masks and monsters and the power of the imagination. TICKETS: Available online at FiligreeTheatre.com and in-erson at the Santa Cruz Theater Box Office for $30.00. Student, Senior and Group discounts will be available on the ticketing site. Concessions are available. TICKETS: Tickets are on-sale now. Available online HERE and in person at the Santa Cruz Theatre Box Office for $30.00. Student, Senior and Group discounts will be available on the ticketing site.